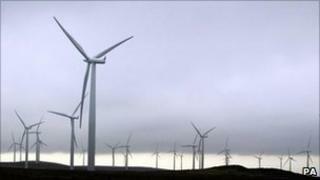 A wind farm opposed by conservationists has been given the go-ahead by the Scottish government. Developer RES will construct 33 turbines, which reach to 393ft (120m) in height, at Dunmaglass, about 20 miles (32km) south of Inverness. The government said the site could power up to 46,000 homes. Ornithologist Roy Dennis and biologist Dr David Bellamy joined campaigns opposed to the project on a site in the Monadhliath hills. RES had been investigating the potential of the location since 2000 and had planned for 36 turbines. In 2005, Dr Bellamy said the project on the Dunmaglass Estate would "sell Scotland's heritage for a mess of wattage". Mr Dennis, who has been involved in birds of prey reintroduction efforts, warned there was a risk of golden eagles colliding with the turbine towers. The Cairngorms National Park Authority and John Muir Trust had also opposed the scheme in 2005. Announcing its approval, the Scottish government said the construction phase of the development would create work for about 55 people. Energy Minister Jim Mather said it also marked a further step towards greater use of "clean, green electricity" in Scotland. He added: "Scotland already gets over a quarter of its electricity needs from green sources and consent for this new development rounds off another tremendous year for renewables. "I am pleased that the developer has agreed a community benefit package for the three local community councils and will fund a substantial package of upgrades of the local B851 road. "RES is also involved in an innovative link with the University of Highlands and Islands for a graduate development programme and an internship programme." Chris Townsend, of Mountaineering Council of Scotland, compiled the organisation's submission to RES's planning application. He said of the Scottish government's approval: "It is a disappointment and the development will destroy the wild feel of that mountainous region."